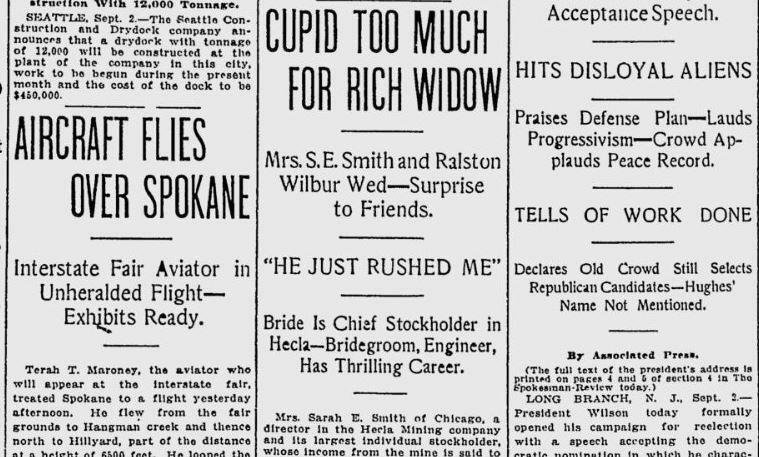 The surprise marriage of Sara E. Smith to Ralston Wilbur was front-page news in Spokane. Why? Mainly because the new Mrs. Wilbur was rich beyond imagining. She was the largest individual stockholder in the Hecla Mining Co. Her income from the mine was at least $30,000 a month. Wilbur wasn’t too bad off either. He was a well-known Spokane mining and mechanical engineer and a partner in the Hallidie Machinery Co.
She was the widow of James R. Smith, Hecla president until his death. From the strike beat: The four railroad union “brotherhoods” called off their planned strike after the U.S. Senate passed an eight-hour-day bill. Some senators argued that Congress was being “coerced,” but their efforts to water down the bill were futile.